A beautifully moving story. It left me in tears of joy, hoping for my own homecoming someday. I can't wait for my "Welcome Home". The rarefied stench, blistered with acid-drenched vapor, corkscrewed through my nostrils. Whatever air that remained fueled the inferno raking the insides of my gasping chest. Distracted by shock, my brain took the time to reason the source was burnt plastic and molten metals. A hellish burst of searing heat combined with a roiling fireball was consuming everything flammable. Hopeless wailings and primal screams, both similar in frustration and agony, were equally snuffed, and done so without regard for rank, stature, or pleas for mercy. 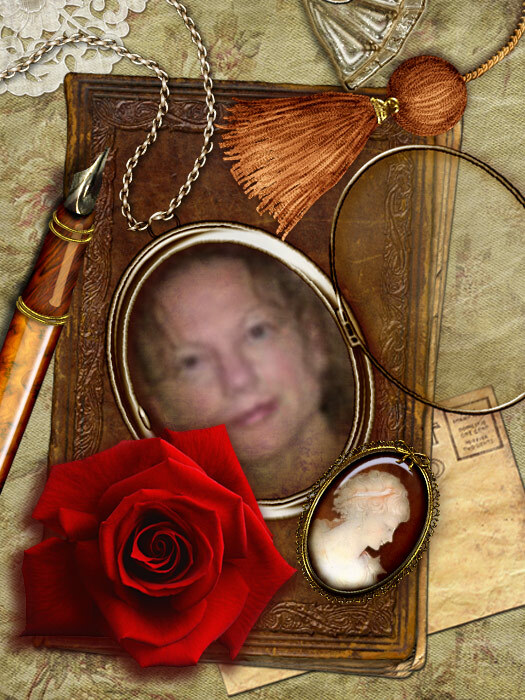 Scared and sad, I reached for, and thankfully found, my husband and children. Although crying and in pain, we were together, having beaten the odds that separated and consumed the others. My distraction became a smile, but only for a moment. My bittersweet euphoria was jarred by a thunderous crack and a blinding flash. Happily, yet groggily, I shook off the lethargy that had kept me impaled on this nightmare's claw. Sweet jasmine threaded and weaved passages through the charred embers of the fading memory. I gasped and my chest heaved as my subconscious desperately purged all traces of the horror. I exhaled, gagging. Instinctively, I turned my head and retched, but nothing came up. The sensations, however severe, disappeared and I was again able to breathe normally. Trembling from the aftermath and praying for reality, I crushed my eyelids closed as another round of blinding light flashed across my face. As I lie on my back, I flailed to the left and right of me in hopes of finding my husband in bed next to me. He wasn't there. Instead, a dark shadow moved across my clenched-tight eyelids. I feared the approach of another wave of terror. "Time to get up, Sleepyhead," my husband quietly, but firmly, said as he reached down to take my hand into his. Feeling the warmth of his touch brought a much-relieved smile to my face. I now didn't want to open my eyes as I was enjoying the astonishment and peaceful sensation of having survived such a terrifying ordeal. A glow began in my body and transferred to my husband's via our held hands. "Why are you shivering?" he asked. "Everything's okay." Panicked, I replied with, "Where are the girls? Is everyone here?" After asking, I immediately thought they should be at school, but remembered we were together for this move. "Are they here?" I meekly repeated. "Look around you, Baby. we're all here and doing fine." He glanced up, still holding my hand, took a deep breath, gazed down into my eyes, and said, Tell you what, take a minute to gather your thoughts and then join us for the walk. They're waiting for us." Again, I smiled. A walk with my family, on such a bright and peaceful day, seemed a perfect transition out of the funk of the fear, dread, and shock I had just endured. "Sounds great," I replied. "Give me a moment to get myself together." My husband nodded, smiled, and moved out of view. He was within earshot, which helped keep my raw nerves calm. I focused my thoughts on the future and gladly let go of the cruelness and misery that brought us to this point. The first thing I noticed as we walked was how spongy and comfortable the soil felt beneath my feet and between my toes. The sensation made me giggle. With each step, I felt a mixture of warm, dry peat and soothing, cool sand. Our procession stopped as I bent down slightly to stare at my toes as they wriggled in the satisfying concoction. Just as I muttered, "this is amazing," a burst of clean spring air wafted past my face and swirled around us. The blend of cool, fresh winter and arid summer carried the strong perfume of gardenias and orange blossoms. Both heady and pungent, in this incarnation, their mix was complementary. The kids squealed with delight. "I can't remember the last time I felt so alive, so relaxed," I reluctantly mumbled. "We've been gone too long," my husband added. "In some ways, though, it seems like we never left." "How so? It's been a pretty rough trip until now. I can't remember anything this comfortable since ... well, since we were last here." "All of this," he said with a sweep of his arm, "never left me. This place is exactly as I remember it." "Wow, your memory is much better than mine," I enviously grumbled. "There I always stayed so distracted; I guess I forgot." I took a nostalgic pause to reflect on the echo of flavors, smells, and occasional image that had consumed so many years. I shook my head and wistfully sighed, "I honestly don't recall much. Life's been such a blur until today." "Our girls probably remember being here because they're so young. Their heads aren't dulled and full of cynical mush, negative energy, and anxieties. I'd be willing to bet they retained most details of our last visit better than we did." My husband grinned as he lightly squeezed my left hand and the right of our oldest daughter. "I never imagined we'd have to give away everything to come back here," I said as a wave of melancholy punched me in the gut, desperate to cling to the past. As the rising sun burned off the morning mist, we all gasped as comfortable familiarity surged into the present, blending with images ahead. The outlines of stone walls and iron gates were the first signs we were home. Decorated with vines, but not burdened with overgrowth, the gleaming-white stucco-on-brick structures were pleasant and inviting. This entrance, a departure from most, was devoid of the blasé oppressive and twisted wrought-iron fencing and snarling crowning gargoyles. We were not to be scared off. I puffed out my chest with pride. We were invited. "Is that Gabriella?" I gasped, incredulous that someone resembling my old best friend was coming into view. "It can't be, of course," I mumbled with astonishment. "She's been dead for at least a dozen years." "I saw her, too," my husband whispered in agreement. "If it's not her, the resemblance is uncanny. Oh, look, honey, whoever it is must know us – she's smiling and waving." I replied with a polite, but quick, wave. "I'd like to find her later to see how much she does look like Gabriella. Might be worth a photo or two." I instinctively reached for the camera that was always slung over my shoulder, but it was gone. Disappointed to have left it behind, I shrugged my shoulders and said, "There will be plenty of time to get acquainted and take pictures. We're home, after all. It's not like we'll be moving again anytime soon." "Mom!" exclaimed our youngest, "Grandma's here! Grandma's here!" She tugged at my sleeve, awkwardly pulling me forward, and I reflexively yanked my husband's hand; an action that caused my husband to stumble as one would when tripping over a small stone. Recovering, he smirked and asked, "What's your hurry? Relax and take it all in. Grandma's been expecting us. Like old times, I'm certain she'll have cookies and hot cocoa ready for the two of you." "I know! That's why I want you guys to hurry up!" My husband and I exchanged awkward glances – the kind that confess a degree of nervousness and resigned reluctance. We smiled at each other and simultaneously breathed out - letting go. I playfully chided our adolescent daughter. "Like Daddy said, let's enjoy our walk. We have plenty of time to get caught up with everyone." It felt like I was more concerned with convincing myself than tempering my child's exuberance. "Take your time," our eldest softly echoed. Strangely, she kept looking back over her shoulder. I wondered was she afraid or was she longing for something. My husband lightly tugged on her hand and said, "It's okay. We're together and everything's going to be fine. We're almost there. Please, let's enjoy the rest of the walk." And so we did. As we strode through the open gateway, I playfully flicked at a scrap of cracked and peeling stucco, which fluttered to the ground. The exposed brown and red brick shined with the newness of having been awakened from a long, peaceful slumber. A gust carried away an adjacent and much larger stucco patch, and I felt guilty for it, as if my carelessness was responsible for the erosion of the beautiful garden wall. Was this a metaphor that my presence was similarly cancerous? Why did my unintended action result in the premature deterioration of something so majestic? I frowned – once again unsure I belonged. My husband whispered, "You and the wall are okay. Come along, Angela." Remorseful and timid, I scurried to catch up. It seemed odd that we passed through the open gate without yet encountering a soul. After shrugging our shoulders, we peered down each of the alleys, deciding to continue straight toward where we believed the town's center stood. Stucco two-story homes lined the narrow, earthen-brick street. Gentle music fell from the open windows; flamingo and turquoise curtains swayed to the steady rhythms. Soothing aromas of simmering spiced beans and rice flowed out the doorways, past the heavy, dried pine doors, and into my nose, awakening my very hungry stomach. I was too excited and nervous to pay it any attention. Our youngest stopped to stare at a petite waterfall, trickling from a wall and onto a lily-pad pond. The pool's crystal-lined bottom glistened as little fingers playfully disturbed the mid-morning sun's dance with the waterfall. Lit-up drops flew off our youngest's hands and shimmered as they created ripples on the clear surface. "Strange," I began to think, but was interrupted by the playful banter of three kookaburras flittering overhead. "Ah, yes, that's better," I thought, grinning as I watched my favorite birds until they passed behind a hacienda's bell tower. I frowned, unsure if I'd ever see them again. My husband interrupted my daydream with, "Look, Sweetheart! Everyone we know is expected to be here. This is a good thing." A glimmer of sadness crept across my shoulders. My head drooped and I watched my shuffling feet as I struggled with what might have been. Like our eldest, I looked behind me for an escape route – a way to bolt. The pang rushed off, as a piece of notebook paper would during a strong breeze. So, doubt tried a different tactic – would I be accepted? After all, I had been away for so long, and my few meager accomplishments weren't much to be proud of. Again, I sighed, letting go of the worry. I regained my composure when familiar voices blended with the pulse of the town. The natural opus sounded better to me than a choir of flocking angels. Driven by excitement and remembering better than we did, our children took the lead, pulling and tugging us through the gently winding avenue. We turned right at a corner where an ancient shade tree stood to offer respite from the mid-day sun. I could swear this silent sentinel bowed slightly as we passed beneath its protective limbs. Cheery voices grew louder and stronger as we approached the town's square. They became more familiar the closer we got. One after another, I ticked names of long-forgotten family and friends. Gratefully, their faces did not portray grudges. They were genuinely happy to see us. Of course, as we absorbed the enormity of what all we had endured to get to this point, they moved in closer; pats on the back and sincere hugs knocked tears of joy from my eyes. Then, the crowd parted, and there he stood, calmly smiling, a twinkle in his eyes, and arms open, awaiting his hug. I hope you felt something after reading "Barefoot Homecoming." Thank you for your interest and your time. 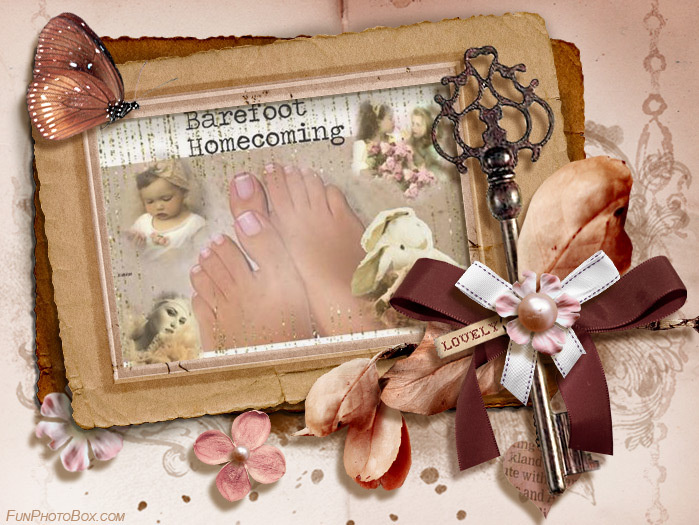 I enjoy listening to music while writing, and creating "Barefoot Homecoming" was no exception. Keeping with the theme of this story, I listened to quite a few inspirational songs. Once again, Ryan Farish's music resonated with me. His energetic song, "Joy," provided the inspiration for the final scene, where family and friends gathered to welcome the family home.